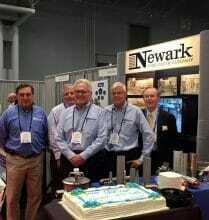 Newark Wire Cloth Company, Clifton, NJ was recently honored with a celebration for its 105th anniversary at the Interphex Show in New York. Ed Several, General Manager of Reed Expo presented the company and its President, Richard Campbell, Executive Vice President, James Campbell with a birthday cake commemorating the occasion. He said, “No other company at the Interphex Exhibit has had such a wonderful, successful product line serving the pharmaceutical industry. Newark Wire Cloth originally was an exclusive manufacturer of woven wire. It is now a service driven company where sales and customer service complement its fabrication facilities. The company specializes in the production of woven wire cloth and special products made from wire cloth. Today most fabrication includes a great variety of metals. Newark Wire Cloth enjoys the reputation of being a leader in innovation in the field of wire cloth products to the pharmaceutical industry. Custom fabrication at Newark Wire Cloth is a job shop approach to business. Each customer’s individual requirement has to be estimated independently, quoted, and materials purchased and manufacturing accomplished after the customer places an order. Newark Wire Cloth has been internationally recognized to meet ISO 9001:200 and AS 9100 certification. This dual certification recognizes the company’s quality management system which meets or exceeds world-class standards. Since 1928, the firm has manufactured a line of standard testing sieves. These are analytical devices made to American Society for Testing and Materials (ASTM) specifications, and used for sizing, testing, and grading particles. The classifying media is wire cloth woven to extremely close tolerances. The sieve business is split between selling to the end user directly and distributing through laboratory supply businesses. Another business area involves supplying filtration/separation products through its Sani-Filtration Division including inline strainers, side inlet strainers, wire mesh overscreens, and custom fabricated strainers for the food and beverage industries. The management team of Newark Wire Cloth including Richard Campbell, James Campbell and Robert Lucki are poised to face the coming years with the same fortitude the company has brought to the table over the past 105 years.